I’m incredibly fortunate that I’m in an industry that is tight knit, supportive and collaborative. In fact, some of my closest friends, Keith Abraham, Tim Reid, Tim Longhurst and Julie Cross are also fellow speakers (and essentially, competitors). But rather than competing, we choose to collaborate. Each January, I host 6-8 of Australia’s top speakers at my home for three days. It’s an intensive retreat of learning, inspiration and motivation. We exchange ideas, share insights and learnings, talk about our wins and share our goals for the year ahead. It’s a pretty open and honest circle of trust where we often talk about our biggest challenges both professionally and personally. And despite often competing for the same clients, our spirit of collaboration means we’re never driven by fear or a scarcity mentality. In fact since we got together for the first retreat three years ago, our businesses have all grown exponentially. Just last month I called another speaker buddy, Adam Fraser when I was struggling with some workshop content. Having a colleague (who is also a direct competitor) demonstrate a generosity of spirit to step up and help me with ideas to ensure I delivered a great outcome for the client is a concept that would be challenging for some. But I have to tell you, when you come from a place of abundance and generosity, it comes back to you tenfold. Last year over 20% of my new business came from referrals from other speakers. My ‘competitors’ have become my biggest advocates. I’m currently working on big collaboration projects with Timbo Reid and another great mate of mine Chris Riddell. Again, we’re often vying for the same business but we choose to cross refer, endorse each other and team up to explore opportunities to deliver better results for our clients, rather than take the protective and defensive position many competitors would. What could be possible in your business if you viewed your competitors as potential collaboration partners? Perhaps you could join forces to start or strengthen your industry’s association. 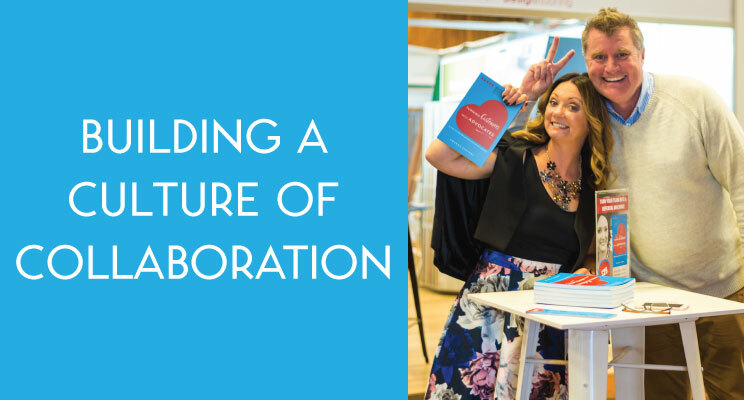 You could get together for a brainstorming session to simply share ideas or you could partner on something specific in the form of a joint venture or collaboration. I’m certainly not suggesting that you get your competitors in a room and share all your business secrets. But as they say a rising tide lifts all boats. If cozying up to your competition is too much, consider collaborating with your customers. Many years ago when I headed up a marketing and research company, I oversaw Customer Advisory Boards for three of Australia’s largest retailers. One of those brands was Best & Less. Each month, I would meet with 10-12 Best & Less customers, a cross section of the community representative of the brand’s customer base. This was a more than an extended focus group — it was a six-month program with a set agenda and clear objectives and outcomes (after six months, a new panel was selected). It was also more than a get together and a casual chat. The advisory board was consulted on a range of issues relevant to the brand and encompassing aspects such as marketing and promotions, the in-store experience, the customer loyalty program and customer service. These Customer Advisory Board meetings not only offered an important view of the brand through the eyes of the customer, they provided a potent incubator of ideas and innovation. In fact, what I recall most clearly from these sessions is how seriously the advisory board members took their role. They came to each meeting clearly having spent hours doing additional work and research outside their set homework. They would have pages of ideas; notes taken from mystery shopping with competitors and other proactive initiatives that were outside their brief. Their obvious sense of pride and ownership reflected their level of engagement and effort. As a result, they became passionate brand ambassadors. In an effort to get a holistic point of view on your business and gather ideas to build a world-class business based on customer advocacy, your suppliers, wholesalers, vendors and other business partners can also provide a valuable perspective. Leading brands such as Ritz-Carlton make this part of their culture of listening. In addition to listening to and measuring the input of staff, guests and desired future customers, Ritz-Carlton hosts regular forums to secure the input of their key referral sources in the travel industry (including travel experts who book individual and corporate business with them), strategic partners (restaurateurs and other retail partners) and the investors and owners of buildings Ritz-Carlton manages. In the end, all business is personal. Great leadership involves listening to the people in and around your business — the people who truly understand and have a vested interest in making your business stronger. When you choose collaboration over competition, generosity over furtiveness, you set a different intention and establish a more constructive energy around you and your business. For more ideas on how to build a culture of collaboration, download your free digital copy of Turning Customers into Advocates here.